International Church of the Gates, New York, was officially started 31st March 2005, and is about to celebrate it’s eighth anniversary. The official opening coincided with the sword of William Wallace being paraded through the streets of New York; the first time the sword had left Scotland in 700 years. The church was planted in Manhattan New York, in order to build a spiritual wall of protection around the city, so the city would be protected from further destruction like that seen on 9/11. For many years DPM (founder of the church) was inspired by Mel Gibson’s films and has been revealing the Biblical stories or the spirit the films were of, illustrating spiritual truths. For example: Braveheart – William Wallace (played by Mel Gibson), couldn’t understand why those leaders whom we admire that seek to rule over us, (represented by the “religious system” currently in place) compromised with the enemy instead of destroying him. Since these leaders wouldn’t fight, God Himself rose up from the ranks of the common man in Scotland, one of the spirit of David if you will, a man to raise an army to overthrow the ruling demonic principalities (then represented by England). He gathered some comrades together and did battle, and Scotland (God’s people) were free of the ruling principality forever. 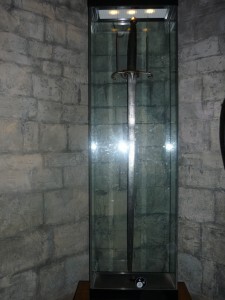 The same sword used by the actual historical William Wallace, has never left Scotland and has remained as a historical treasure for over 700 years to this day! Scotland prophesied, the enemy would never have William Wallace’s sword! Before the New Years Trip to Manhattan NY, DPM had no desire whatsoever to go. But told God he would be obedient and asked if God would please warm up the weather for him. Results? 2005 News Years Eve in Times Square was one of the warmest in centuries. The day before leaving for NY, Prophets told DPM that men would begin to hear what DPM had been speaking for years, as the rule of the religious vail was broken. Then, at the end of the New Years Eve trip God gave DPM a dream, a ruling principality, confronting DPM says: “You stole my WATCH, and I want it back! DPM understood this to mean one level of controlling spirit had lost it’s foot hold over the city/nation, and that the fight was on to completely eradicate that which resisted the rule of the Spirit of God over our media cities, which control our perception of God and the perception over our nation. The spirit DPM took the “watch” from, represents a ‘religious spirit’, which blinds many of today’s Christians as to the gifting and power of the Holy Spirit that God has given us, so we could truly rule and reign over ALL the works of the enemy! What does all this have to do with the new church plant in New York? Thursday March 31 2005, the New York Church in Manhattan NY officially opened. Friday April 1 2005 the sword of William Wallace, which represents freedom from tyranny, left Scotland for the first time in 700 years and arrived in New York! Saturday April 2 2005, Pope John Paul II died. In a sense, this represents the old religious system or procedure that is passing away, making way for a fresh, new move of God that indeed is already here. On Friday, a YouTube video of Florida legislators in a committee hearing was uploaded. They were shocked during the proceedings on a bill to require medical care to an infant who survives an abortion when a Planned Parenthood lobbyist endorsed a right to post-birth abortions. The lobbyist representing the Florida Alliance of Planned Parenthood Affiliates, Alisa LaPolt Snow, testified that her organization believes the woman seeking an abortion and her abortion doctor should be the ones to make the decision to kill an infant who survives a failed abortion. In an emergency meeting early Friday morning, Mr. Kim was photographed signing an order directing rocket units on standby to strike the US and South Korean targets at any time. This was prompted after a nuclear-capable US B-2 stealth bomber was part of joint military drills with South Korea hours earlier. The photographs published by the state-run Rodong newspaper included one with a chart labeled “US mainland strike plan” with trajectories of missiles in the vicinity of Hawaii, Washington D.C., Los Angeles, and Austin, Texas. AustinB-2 stealth bomberhawaiiKCNAKorean Central News AgencyLos Angelesmainlandmilitary basesMr. KimNorth KoreaPacificphotographedRodongSouth KoreastrikeTexasWashington D.C. The supreme court is today hearing the arguments in the case which will determine the constitutionality of the Defence of Marriage Act (DOMA). The case is being brought by Edith Windsow, who is sueing the US government over $363,000 in federal estate tax she paid at the death of her partner Thea Windsow. The court is expected to make a decision in late June. The 83 year old Edith Windsow was engaged to her partner Thea for 40 years, when in 2007 they went to Canada to marry. After Thea died in 2009 Edith had to pay the federal estate tax. She argues that had her wife been a husband then she would not of had to pay the tax, and therefore she believes DOMA to be unconstitutional, because it discriminated against her. Edith Window’s story led President Obama to say the he and the Justice department would no longer defend the constitutionality of DOMA, in February 2011. Windsow will be represented by Roberta Kaplan. Kaplan is regarded by her peers in the Law to be one of the finest lawyers of her generation, being voted by the National Law Journal as one of the top “40 under 40” lawyers in the US. Ahead of the BRICS summit in South Africa, China and Brazil have struck a deal which will see the two emerging economies trade in each others currencies, and not the dollar. The deal amounts to around $30 billion per year, and is the most significant step the nations have taken to shift the dynamics of global trade away from the dollar. The BRICS nations (Brazil, Russia, China, India and South Africa) have long sought to change the balance of global trade away form the dollar, which is presently the global reserve currency. The BRICS summit will also discuss the formation of a new International Development Bank, which they hope will serve as an alternative to the World Bank. The BRICS leaders argue that the establishment of a new development bank would make the global banking system more democratic. WASHINGTON DC – SUPREME COURT CONVENES AT 10am TUESDAY TO HEAR DOMA ARGUMENTS – HOW DOES THE SYSTEM WORK? 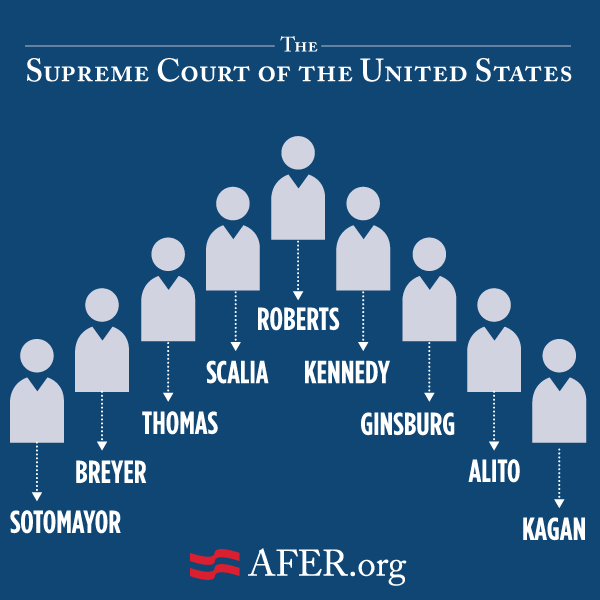 An article published by the American Foundation for Equal Rights gives excellent insight into how the Supreme Court Judges proceed, as they hear arguments around the California Proposition 8 case on Tuesday 26th at 10am and the Defence of Marriage Act on Wednesday, taking place at the Supreme Court in Washington DC. The nine Justices are seated by seniority. The Chief Justice occupies the center chair, the senior Associate Justice sits to his right, the second senior to his left, and so on, alternating right and left by seniority. Audio of the proceedings will be made available shortly after oral argument concludes on each day since cameras and love updates are prohibited from inside the courtroom. The Supreme Court has said that audio will be released by 1 p.m. EDT on Tuesday and 2 p.m. EDT on Wednesday. Since seating inside the Court is extremely limited, it is on a first come basis. Shortly before 10:00 a.m., the Justices will meet in the Robing Room. This is where they will all shake hands and don their robes. The Chief Justice will call the case and invite Charles J. Cooper, attorney for the Proponents of Proposition 8, to the lectern. He has 30 minutes to make his argument. Once Mr. Cooper has concluded, the Chief Justice will invite AFER lead co-counsel Ted Olson to the lectern which will begin his 20 minutes to make his argument. He may choose to reserve some of his time for a rebuttal after the argument for the United States has been compeated. After Mr. Olson has completed his argument, the Chief Justice will invite Solicitor General Donald B. Verrilli, Jr. to the lectern. The Solicitor General has 10 minutes to make his argument for the United States as amicus curiae, or “friend of the Court”. He will be speaking in support of AFER’s Plaintiffs. If Mr. Cooper reserved time for rebuttal, he will then have the remainder of his time to address the Court. The case is submitted for consideration once the oral arguments have been completed. The Justices are expected to vote at their private Conference on Friday, March 29. A final decision should be published by the end of June. The U.S. Supreme Court is considering two cases that deal with marriage equality for gay and lesbian Americans this week. On Wednesday, March 27, the Court will hear oral argument in United States v. Windsor, a challenge to the Defense of Marriage Act (DOMA). This is the 1996 law that prevents the federal government from recognizing the legal marriages of gay and lesbian couples in states with marriage equality. The case came about because Edie Windsor, an 83-year-old widow, was forced to pay $363,000 in estate taxes after her wife died. This is a tax she would not have had to pay if she was married to a man. Ms. Windsor claims that DOMA violates her right to equal protection of the laws and is represented by the ACLU. In a last minute deal Cyprus managed to secure the €10 bn bailout it requires to avoid bankruptcy. The Cypriot parliament agreed on a deal which will see bank deposits over €100,000 taxed. The troubled Laiki Bank will also be wound up, and split into two parts a “good” bank and a “bad” bank. The largest Cypriot bank, the Bank of Cyprus, will undergo major restructuring. Deposits in the Bank of Cyprus over €100,000 have now been frozen. It is believed the levy on bank deposits will be around 30%. The Cypriot finance minister said they were keen to protect individuals and small depositors. The majority of account holders with over €100,000 are wealthy Russians. The deal has angered Moscow, who have accused the eurozone of using the crisis to go after Russian money. Laiki and Bank of Cyprus remain closed with ATM withdrawals limited to €100 a time.